While those words were uttered in the North Atlantic, seeing these icebergs reminded us of that night in 1912, and the sheer power the Great Lakes hold within them. 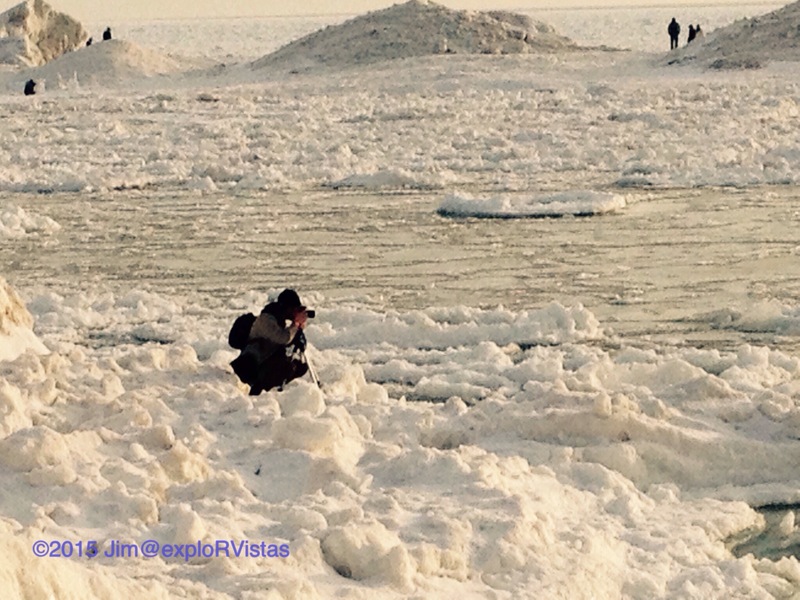 Last weekend, we posted photos of the ice at Grand Haven. Since then, Lake Michigan had a strong storm roll through with winds coming down it’s length out of the north/northwest. 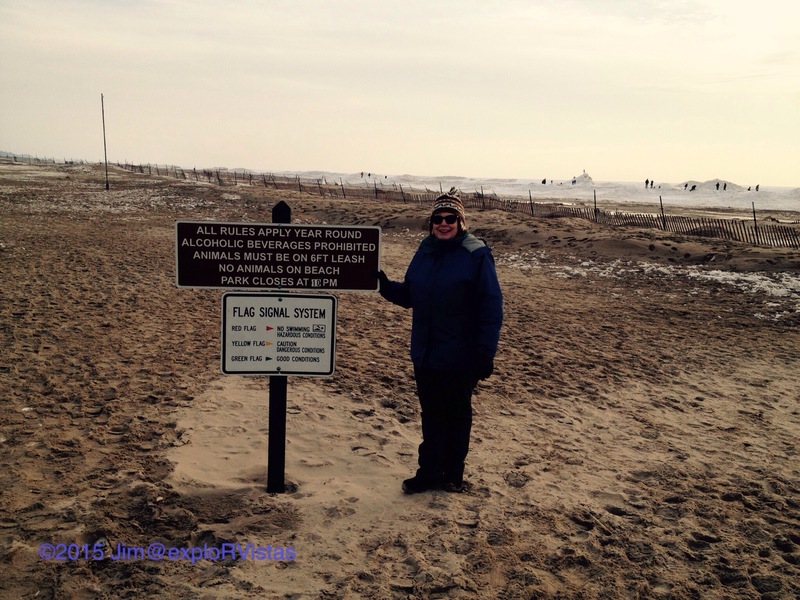 Yesterday, after the storm passed, we went to Oval Beach in Saugatuck to take a look. This is the same beach that taught us to respect Lake Michigan when we took a day trip from Holland on a friend’s 16 foot Prindle Cat. We were tossed into pilings by a squall that kicked up and snapped our mast rigging. (Ask us about that at a campfire sometime). 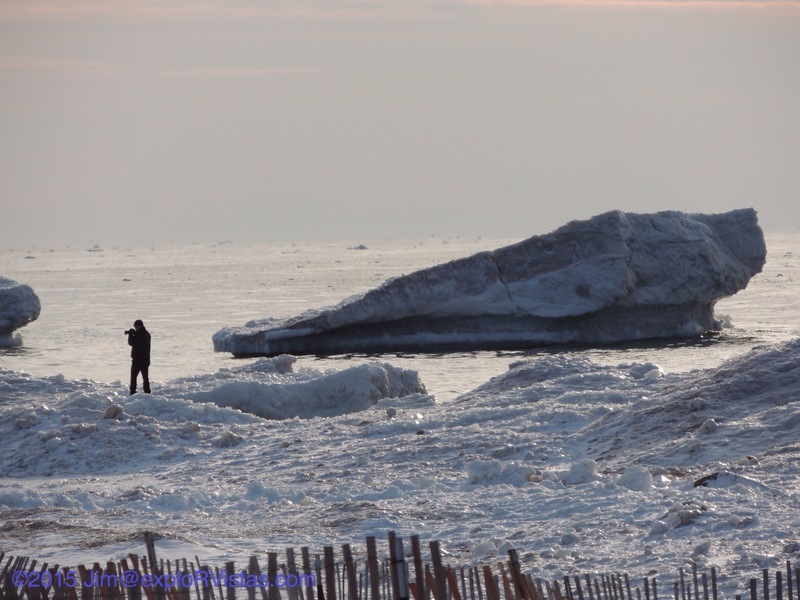 As far as the eye could see, the ice that lined the lakeshore the week before was broken apart and lodged into the lake bottom at odd angles. 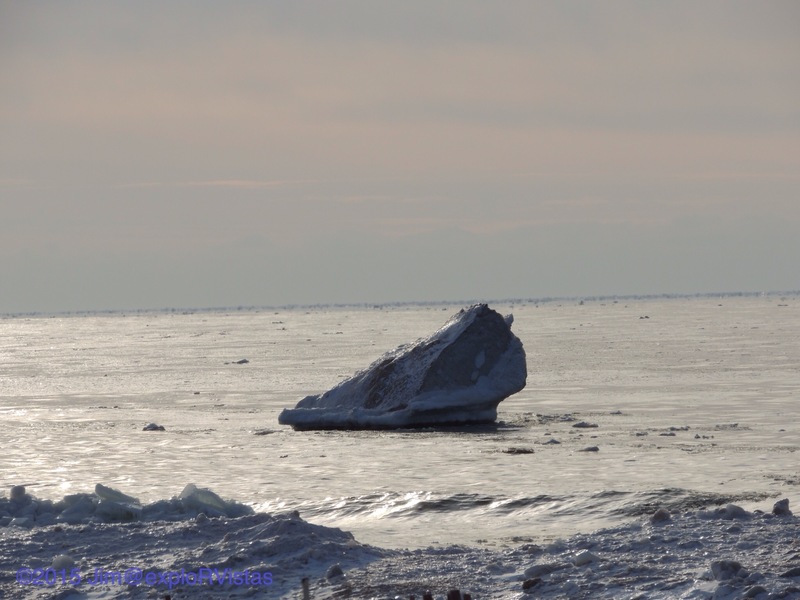 Wind gusts in excess of 60 MPH broke the ice into large bergs. Did these chunks originate in Michigan or Wisconsin? This gentleman ventured out for a closer look. 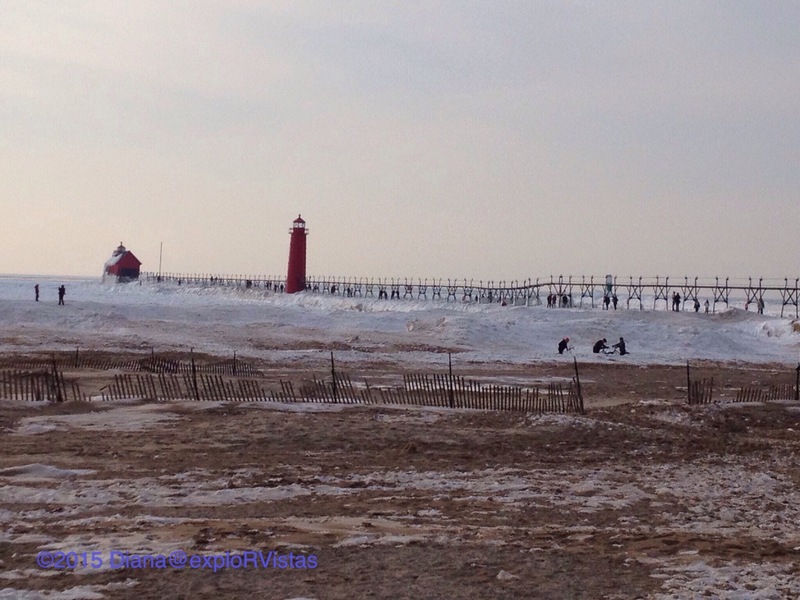 Last week, most of the lake was open water at Grand Haven. This week had broken chunks out as far as we could see. 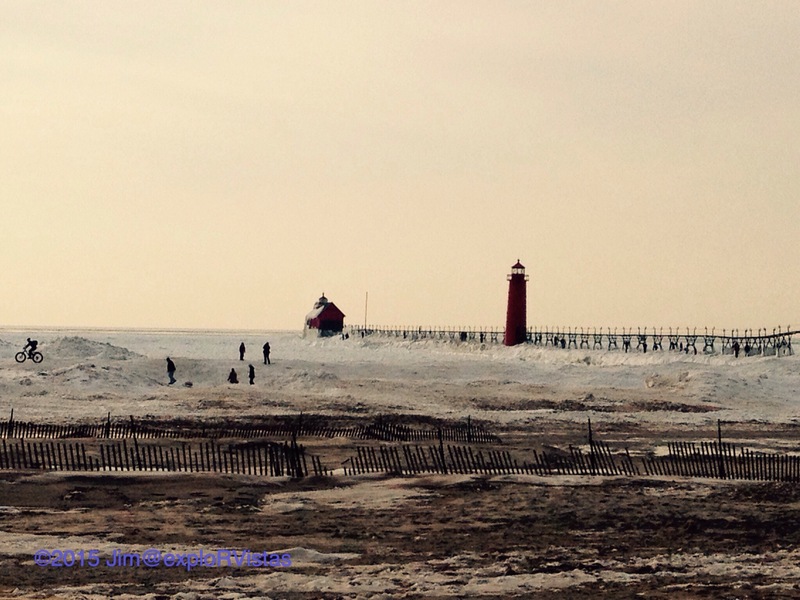 It should be stated that Saugatuck is 30 miles south of Grand Haven. It is 100 miles north of the southern end of the lake. 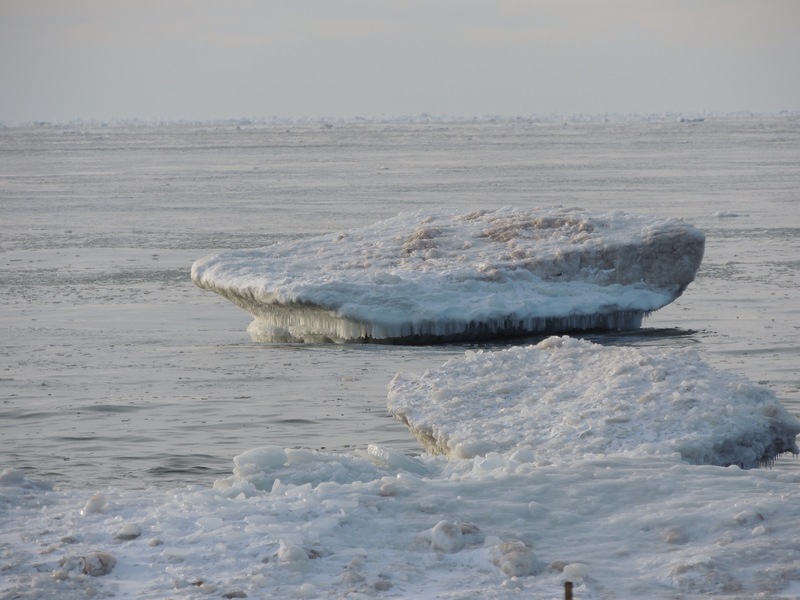 When the wind comes down out of the north, the southern end of the lake fills with ice. 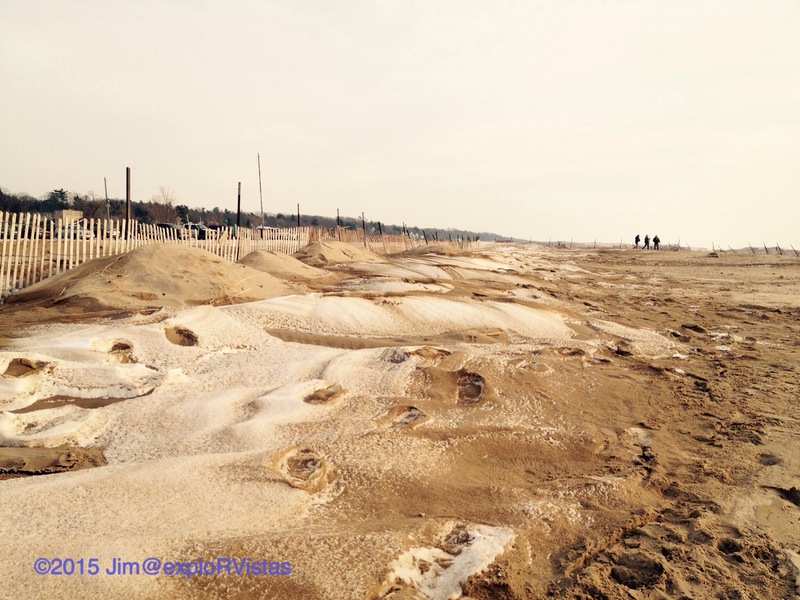 The sand and snow on the beach were swirled together into a parfait. 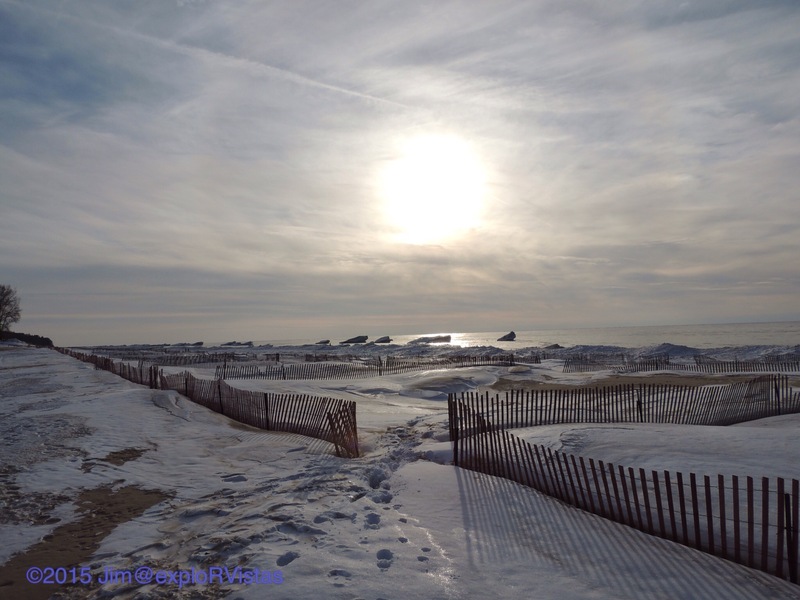 Even though the winds were fierce, the temperatures broke record lows and the wind chills were well below zero, the sun was out through most of it. It was absolutely beautiful. Nothing delivers the promise of spring like a sunny winter day. 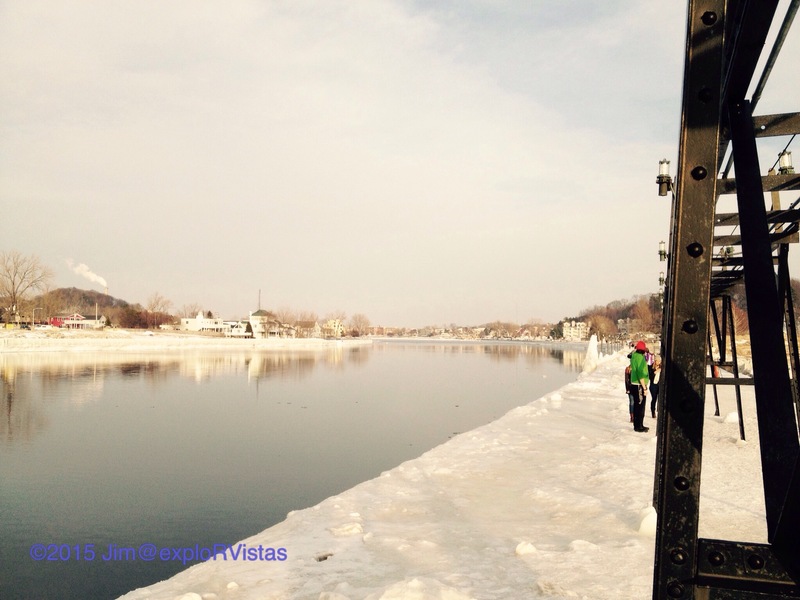 On Saturday, the sun came out and the temperatures rose into the upper 30’s. We had completed our second LaughFest volunteer training by 1 PM, so we decided to go for a drive to Grand Haven to see the Lake Michigan shore. Along the way, we stopped at Engelsma’s Orchard’s farm stand and purchased apples, cider and honey. We then took the scenic Leonard Road, which winds along the Grand River for 25 miles through the quaint towns of LaMont and Eastmanville. We stopped at Greenvale Farm and sampled cheese, which resulted in another purchase. We spoke with several of the dairy workers, who were a delight to converse with. In Spring Lake, we stopped at Vander Mill Cidery. They have a wide variety of very tasty hard ciders, and they now have a nice little restaurant at the front of their establishment. They have quite a few gluten free offerings. Of all the local ciders, Vander Mill is tops on my list. 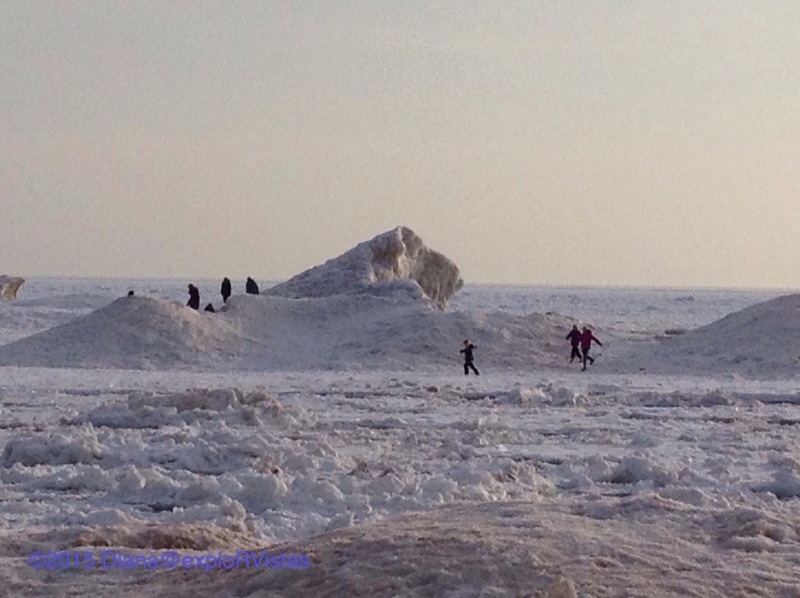 When we arrived at Grand Haven State Park, we were pleasantly surprised to see a multitude of people out on the ice piles having fun! Old and young, on foot and on bicycles…everyone was out having a good time. 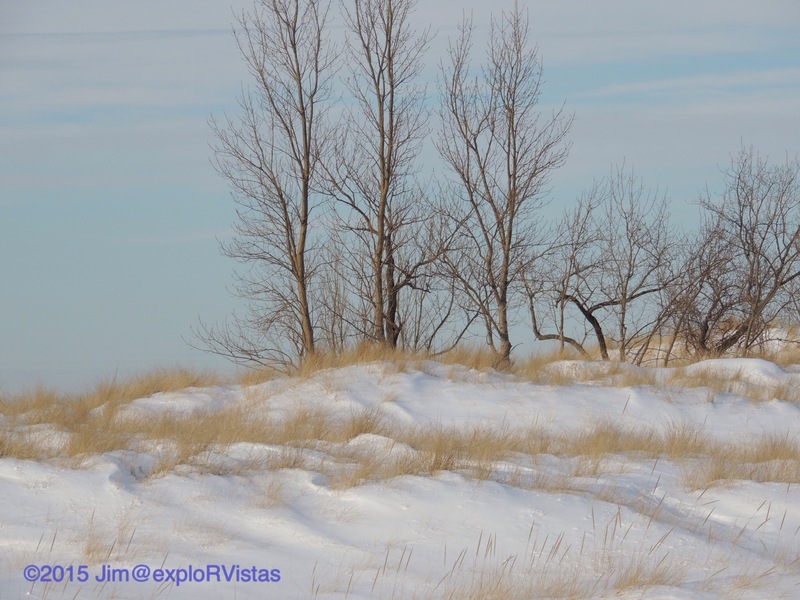 The largest of the piles extended out a few hundred yards from the actual lakeshore, and there were plenty of brave souls who ventured out to the highest peaks. This gentleman drove two hours from the east side of Michigan to capture some images for himself. 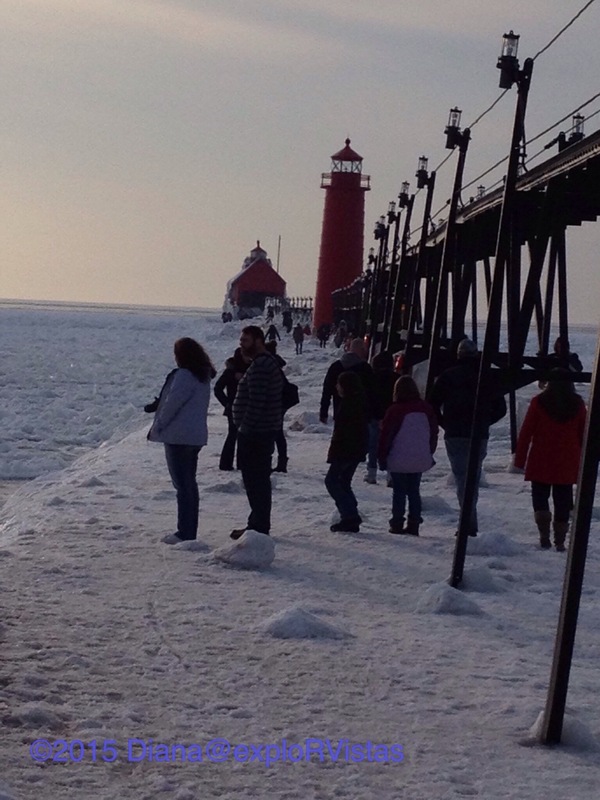 The pier was packed with people from end to end, despite being coated in ice. We decided to venture out a little ways. It started getting a little too slick for our tastes, so we stopped partway and enjoyed the view. We met a couple visiting from Shanghai, China who were taking it all in. The channel side of the pier was open water. This is where the Grand River meets Lake Michigan. 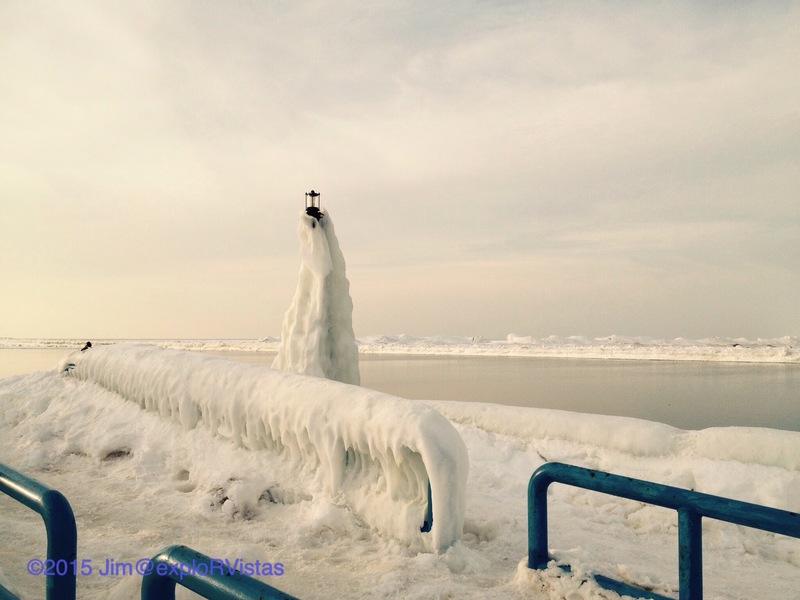 Railings and light posts were coated with ice from previous storms, turning them into wintery sculptures. It is probably safe to assume that no flag on the pole means it is too cold to swim! 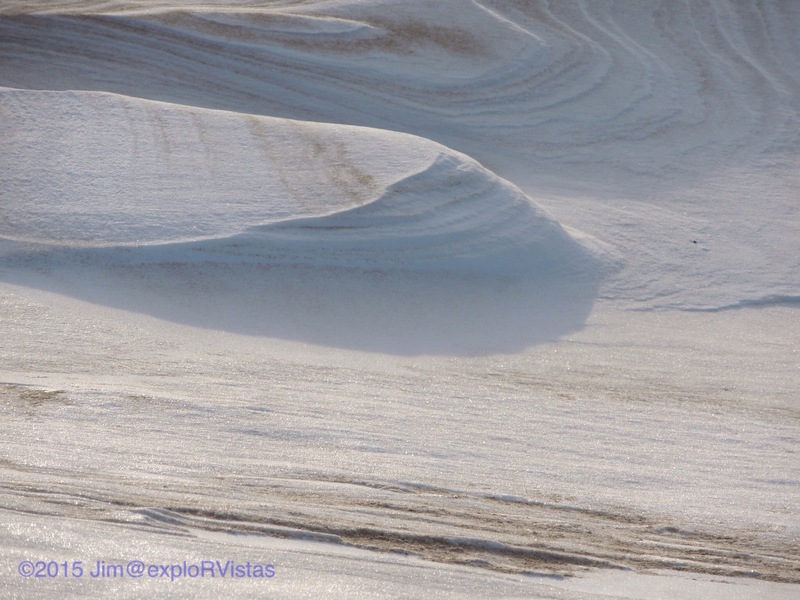 It was interesting to see the snow and sand mixed together. 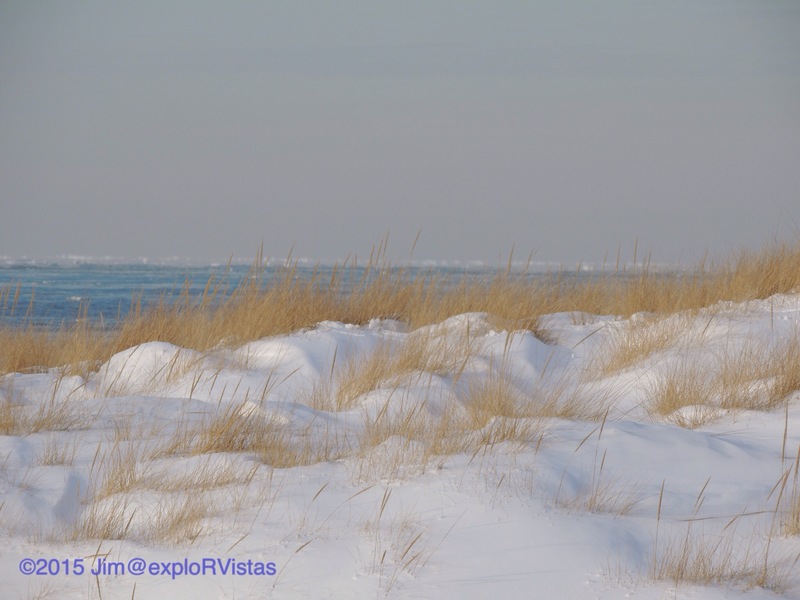 We had to be careful, as we would step on what we thought was a solid sand pile, only to sink ankle deep into a sand covered snow drift. 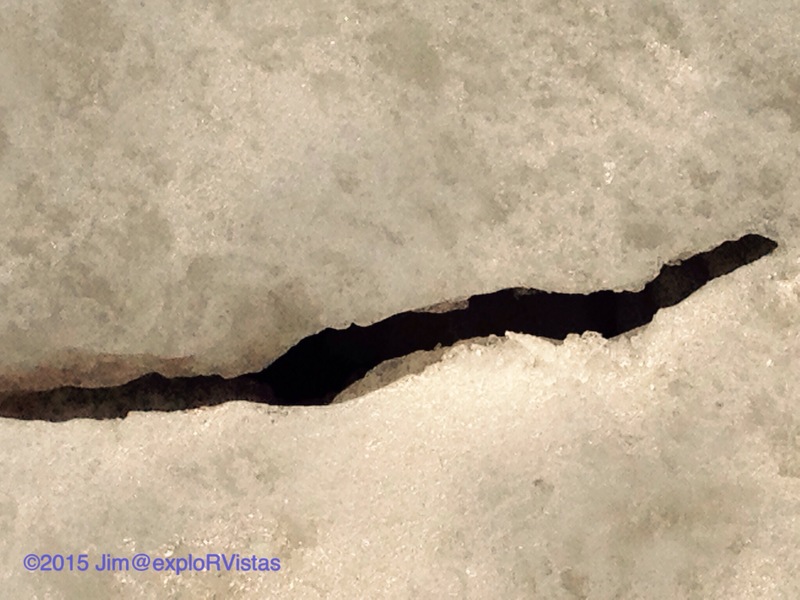 The ice piles also had plenty of cracks and fissures. It was quite evident that, even though they seemed solid, the mountains of ice were actually moving. We definitely were watching where we were walking! All the way back to Grand Rapids, we kept repeating how much fun we had. This sunny winter day had delivered a promise to us, and spring will surely be on its’ way soon! 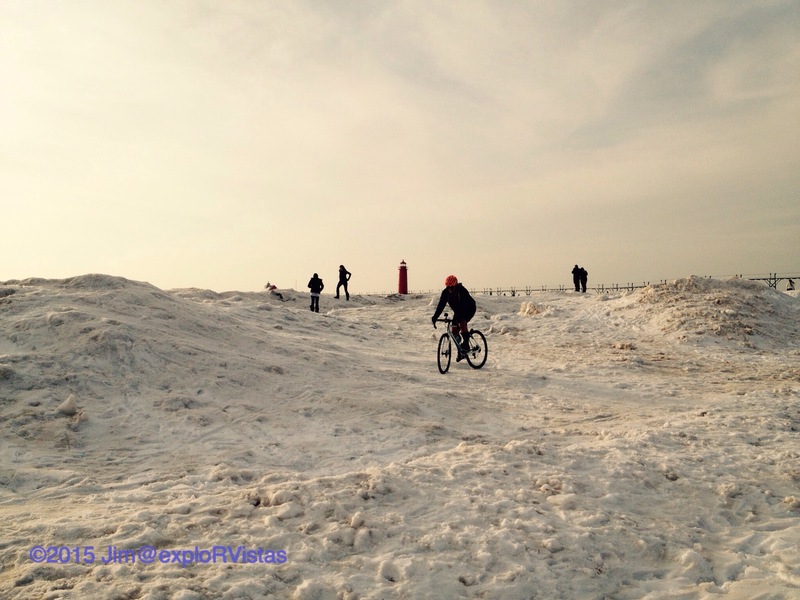 Living in West Michigan in the winter, we tend to treat a sunny day like a kind word. Wednesday was indeed one of those days. Jim’s sister texted us on Sunday and mentioned that she and her husband were going to run over to Manistee on Wednesday to go to the casino, and asked if we wanted to meet them there. We hadn’t been to a casino in a year or two, so we thought it would be fun to run up there and meet them for the day. Pardon the pun, but the weather along the lakeshore can be a gamble this time of year…but Wednesday was Senior Day, and we are considered seniors now at 56 years old, at least in the casino’s eyes. So off we went! 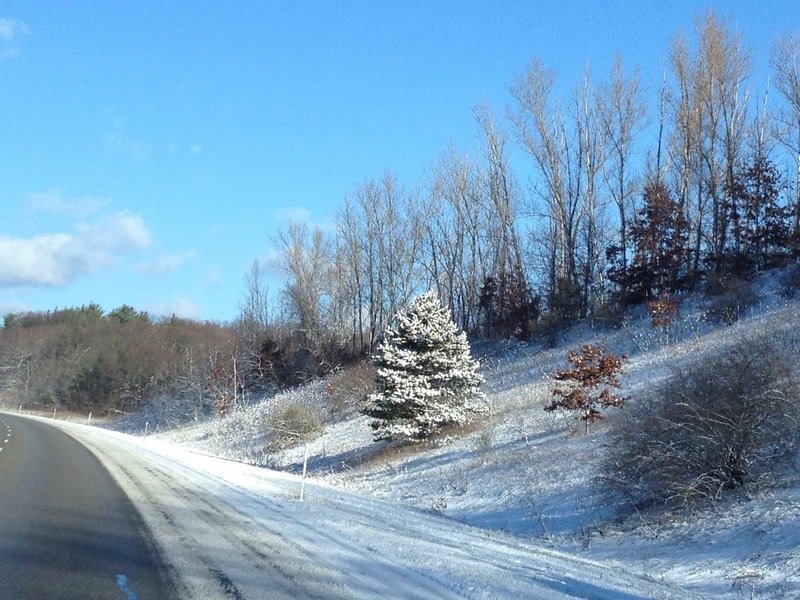 From Grand Rapids, there are two routes you can take: the inland route via US 131, or the lakeshore route, via US 31. We chose the lakeshore route, as the sun was out. Those familiar with lake-effect know that ‘sunny in Grand Rapids’ doesn’t always translate to sunny at the lakeshore. Sometimes there can be a raging blizzard out there. Well, we lucked out on Wednesday, as the above photo shows. That was taken along US-31 near Pentwater. It was an absolutely beautiful drive. A couple of things that are encountered along US 31 south of Ludington are the Lake Winds Energy Farm and also the Ludington Pumped Storage Facility. The former consists of 56 giant wind turbines dotted around the local rural landscape. There is no missing them. The latter is a giant reservoir built in the 1970’s. It sits high above Lake Michigan. The way it works is this: At night, when energy usage is low, water is pumped into the 27 billion gallon reservoir. In the daytime, when energy usage is high, the pumps become turbines and generate electricity as the water flows back into Lake Michigan. We will blog more about these places in the future, when we can get some photos to go along with the story. We arrived at Little River Casino before lunch. This facility is owned by the Little River band of the Ottawa Indians. 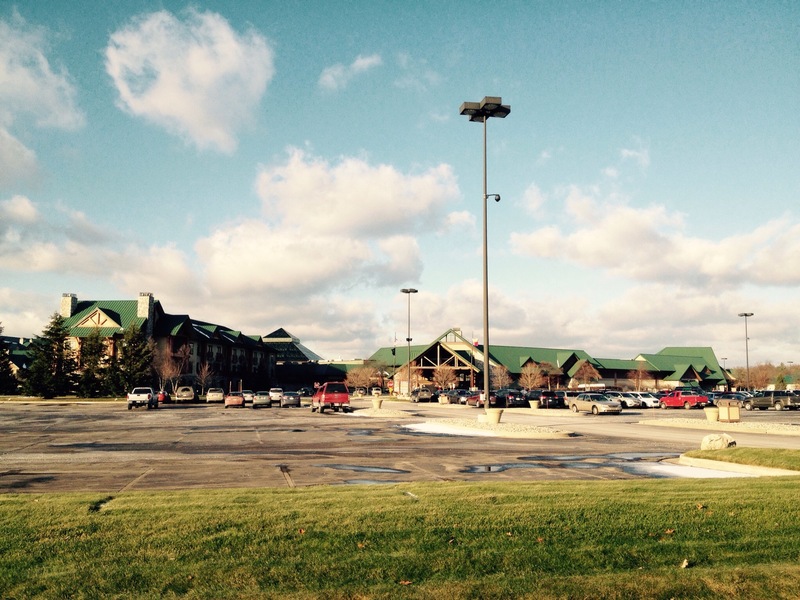 It boasts of a casino, a large hotel, an auditorium, a few restaurants and an adjoining RV park. It is one of the nicer casinos in Michigan, and they have a wide array of promotions and giveaways to keep you coming. For those of you not familiar with Michigan; casinos are the only places in the state that are exempt from the public places smoking ban. Whether you smoke or don’t smoke, let it be noted. 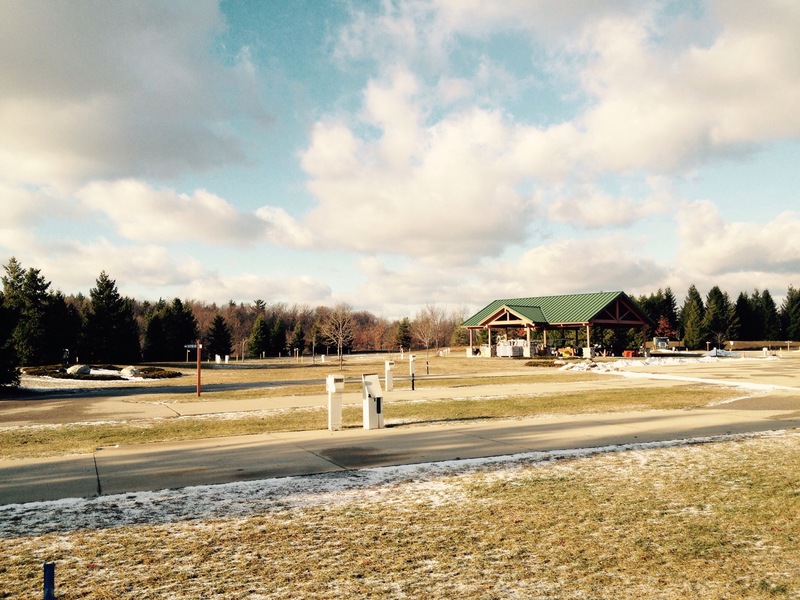 Little River boasts one of the nicer casino RV parks in Michigan. Plenty of full hookup sites are available. Campers are given free reign of the hotel pool and hot tub, which are located indoors. The RV park is open April through October. After making our donation to the tribe, we had a very nice lunch at one of the restaurants at Little River. The staff went out of their way to make Jim a gluten free burger, even though they didn’t have a GF menu. He didn’t get sick, so they succeeded! After that, we headed back home. On the way, we stopped in the town of Manistee. This charming little town is where James Earl Jones got his start at the Ramsdell Theater. We drove west off of US 31 through the delightful main street of shops and went to the park along the lakeshore. Douglas Park is a first rate park, with plenty of picnic tables, grills and playground equipment. The beach at this park is actually within the confines of the breakwater, so the water itself is technically from the Manistee River. 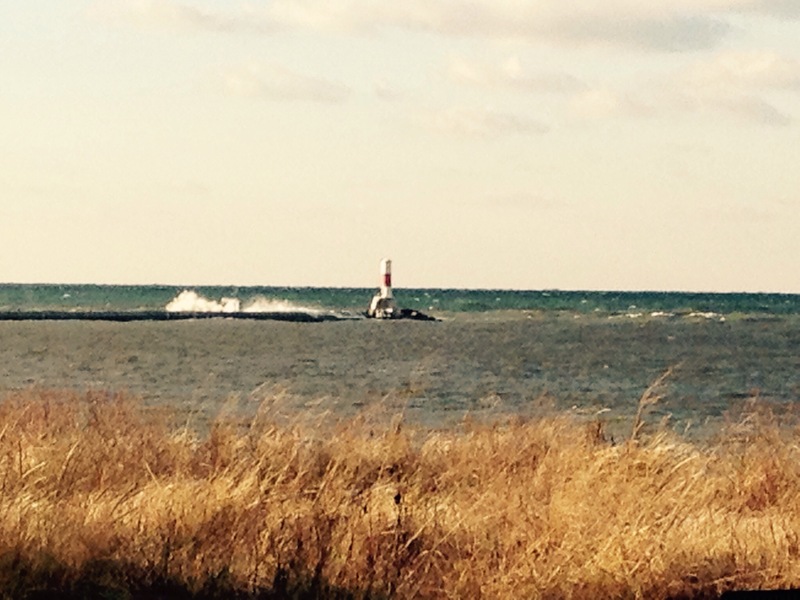 As is documented in the above photo, Lake Michigan was kicking up some waves on Wednesday. It is a rare winter day that a person gets to see this sort of wave action without being accompanied by a lake-effect snow squall. 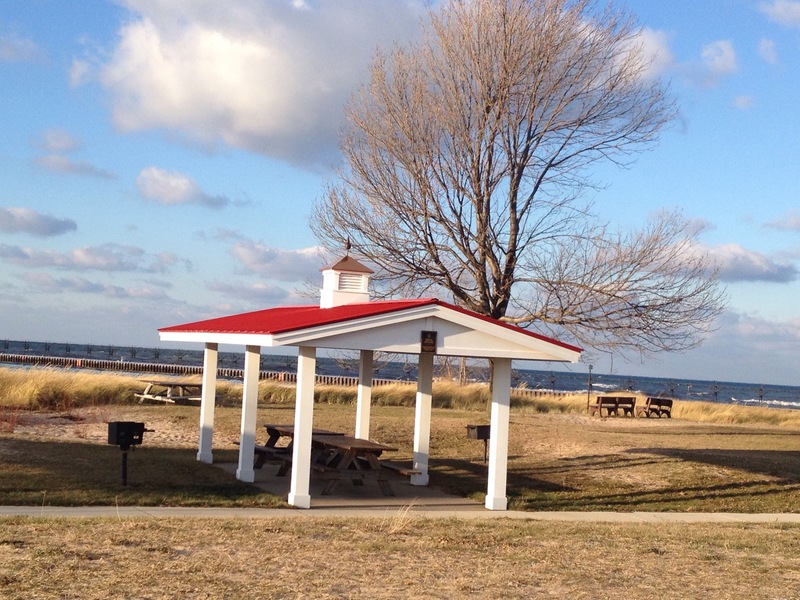 Manistee also has Orchard Beach State Park to the north, with camping near Lake Michigan. All in all, we had a memorable day. It was definitely the type of day we will draw from when the snow starts piling up around us!